Even in heavily worn condition your 1866 Indian head penny value is above $43. It is a significant find and needed by many collectors. 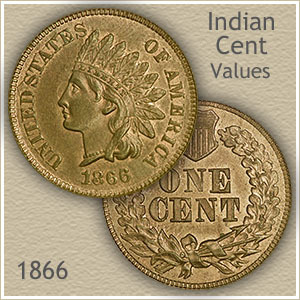 Some of the highest valued Indian pennies are from the 1860’s. Most found today are heavily worn, those with only slight wear and clear detail rise quickly in value. As an example, pictured is an 1866 penny in the rare "uncirculated" condition. These well preserved coins are the highlight to any collection and sell routinely in the hundreds of dollars. Separating the different values of these coins are subtle amounts of wear, nicks and abrasions. Your coin is one when closely examined may lead to finding it is worth above average in value due to above average condition. Doubling in value because of slight degrees of wear is highlighted in the chart. 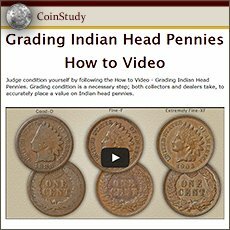 Grading the condition of your Indian penny is covered below with images and descriptions. Remarkable that a coin minted so long ago remains today bright and lustrous as when new. Not only is this coin "uncirculated" in condition and grade but at the top end of its definition. As with circulated coins, subtle details on uncirculated coins impact values. Within the uncirculated grade this coin is noted for the bright orange and red toning. The absence of marks and nicks also set it apart from lower quality examples. Also, the sharpness of the strike during the minting process gives this coin a very detailed appearance and added appeal. Value of this 1866 Indian penny reached $575 at a David Lawrence rare coin auction. 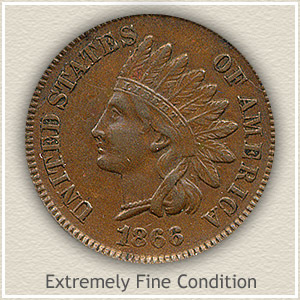 Multiple bids were placed indicating a strong demand for high quality Indian pennies. The market for collectible Indian pennies is strong. Circulated examples are widely collected. Many collections grow to an advanced stage beyond circulated examples and include gem condition coins. Your coin is part of an active search by collectors and dealers in the hobby. 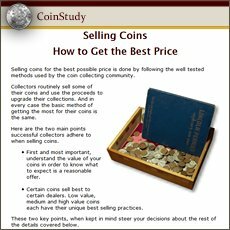 Comparing your coin to the grading images and descriptions points to its accurate value on the chart. 1866 pennies are a scarce coin, small details raise and lower how much it’s worth significantly. Collectors and dealers actively seek better quality examples and are willing to pay good value. Uncirculated: All the characteristics of a new penny remain with one in "uncirculated" condition. 1866 Indian head penny value is highest in this grade. The original mint luster is unbroken with no wear to the coin. Examine the highest areas for signs of wear. The first to exhibit abrasions is hair above the eye and curls behind her neck. Extremely Fine: Although a small amount of metal has worn from this coin it is still very sharp and crisp in appearance and this 1866 Indian head penny value is remarkably high. Important is a readable "Liberty" within the headband. Her cheek remains well rounded as does the hair detail on the neck and near the eye. Clear separation of all design elements is necessary to reach the extremely fine grade. Good: 1866 pennies in "good" condition are collectible and worth a nice premium. Although worn to almost an outline, her portrait still shows slight detail. The lettering and date along the rim is clearly visible but in shallow relief. If your coin has avoided any serious dents and nicks and is not any worse than just described, it is considered solid for the grade. A very popular coin, everyone understands and has heard of the value of an Indian Head penny. Common dates are now worth one dollar each. Many collectors are building collections and putting a heavy demand on the rare dates and better condition coins. 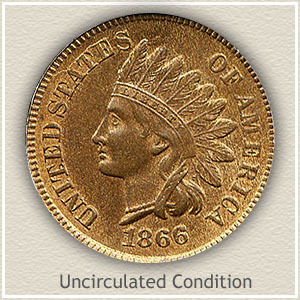 Find not only your 1866 Indian head penny value but all dates in the series are listed on the chart.